A good local asset, but with a bit of effort could be excellent. Breakfasts, juices, sandwiches are good for the price. Major issue for me is the inconsistent coffee. In the 18 months we have been coming here I have had some excellent coffees and many below average ones. 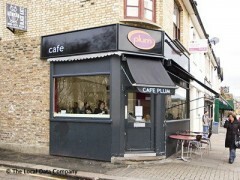 At Plum (and other cafes) when I have mentioned this the usual retort is that ‘we put 2 shots in the same as before’. Anyone who knows about expresso coffee making knows that many factors effect how a coffee come-out – amount of coffee in the each shot, adjustment of the machine valves, adjustment of the grinder valves, ratio of froth to milk…..Claiming that the coffees they produce are always the same shows a lack of knowledge, or worse, trying to mislead customers. A £2.20 latte costs about 60p to make, so if you enjoy a 75% profit on something it is reasonable for customers to expect it to be good, and consistent. The so called 3rd wave of cafes in London is producing some excellent places (e.g. Kaffeine, Tapped & Packed, St Ali, Flat White….) so stuff the passed as OK a couple of years ago will (I hope) become increasingly less viable. And what an opportunity for a local cafe to excel over its competition if the copied the leaders! Service at Plum is OK (and can be friendly) mostly, but they do seem to sometimes have a problem if you make any criticism. Getting stroppy with customers who make a reasonable complaint is not acceptable. In all, good, but could so easily be very good.